Every art show is the result of the artist’s imagination pouring out into reality, allowing ideas to seize tangible representation in the physical universe. But Trenton Doyle Hancock’s new show at Mass MoCA, “Mind of the Mound: Critical Mass,” is also an effort to pull visitors inside the imagination of the Houston-based artist. The show offers an immersive experience in which the interior universe of his childhood co-exists in real space with the world of Hancock’s viewers. Hancock is a painter, but the new show has given him the opportunity to take his concept of the “Moundverse” beyond the painting medium and to meld further autobiography with his creations. The Moundverse compiles characters and situations that Hancock has had in his brain since he was a kid, and the show offers a winding multi-colored pathway that makes a visitor feel like they’re walking a gameboard into Hancock’s thoughts. In Hancock’s vision, Mounds are peaceful plant-human hybrids that clean the environment. Their enemies, the Vegans, try to kill them, but the Mounds are protected by the hero Torpedoboy. From this basic scenario springs an entire universe of stories that Hancock has fashioned, starting at age 2. The MoCA show, which opened March 9, features some actual, full-scale Mounds, as well as selections from Hancock’s massive toy and game collection, with Moundverse objects and toys placed among them, creating a kind of alternate-universe marketing hall of fame. There are also copious giant painted panels from the graphic novel he is currently working on telling the mythology behind the Moundverse. As Hancock was growing up, he was influenced by toys and especially comic books like Spider-Man and Iron Man. He was raised in Texas in a family of evangelical Baptist ministers and missionaries, and his parents’ strong religious beliefs led to conflict. His mother especially would target his and his brother’s pleasures as the devil’s work and trash them. Action figures were frequent victims of this spiritual cleansing of his childhood fun. Oddly, certain movies and video games escaped persecution, and those shaped his worldview far more than his parents’ Christianity. The Garbage Pail Kids were definitely evil, though. So was Dungeons & Dragons. They ended up tossed in the fire. Eventually Hancock and his brother figured out what would pass and what wouldn’t. Material belongings could be destroyed, but his imagination was untouchable. Hancock began to create characters that spoke to his life. His first, Torpedoboy, appeared in fifth grade, the result of Hancock starting to wear glasses. Hancock wrote short stories about Torpedoboy on lined paper, accompanied by illustrations, and the Moundverse was born. By high school, he had embraced comics and was creating strips and gag panels for the school newspaper. His artistic path took a turn in college at the Tyler School of Art at Temple University, where he studied graphic design and began to envision a life in fine arts. Joseph Campbell’s writing about the hero’s journey had crept into his Moundverse ideas, and at the same time he found inspiration from Todd McFarlane’s creator-owned Image Comics and discovered cartoonists like Art Spiegelman and R. Crumb. “That’s the point where things really started to become clear to me that I didn’t have to choose, I didn’t have to be a comic book artist or a painter,” Hancock said. “I could really put together something that was a composite of both of these ways of thinking. Eventually the Moundverse moved beyond paintings. In 2005, a collaboration with Ballet Austin in Texas used the Moundverse as inspiration and saw Hancock creating all the sets and costumes. Hancock followed the ballet collaboration with public art projects in parks, hospitals and stadiums that helped him think adventurously about scale and access to his Moundverse ideas. 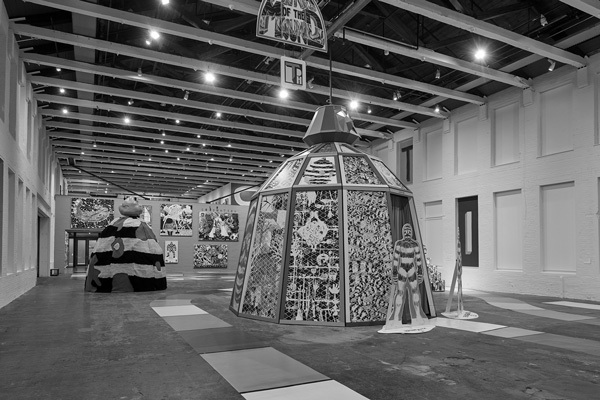 Hancock said his experience of going booth to booth on a visit to the San Diego Comic-Con in 2015 fueled the gallery presentation of the Moundverse at Mass MoCA. He also was inspired by trips he and his wife have taken to theme parks, where he studies how the layout and the rides construct narratives within each park. Returning to his original inspiration, comics, Hancock began working on a graphic novel of the Moundverse in collaboration with his friend, comic book artist Tom Neely, as colorist. 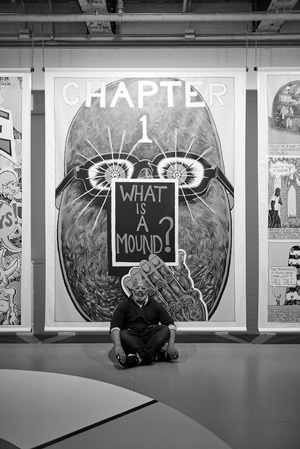 Samples of this work now hang at Mass MoCA, and Hancock plans to compile them into book form telling the story of the Moundverse, which is also the story of Trenton Doyle Hancock and the lessons he has learned.